This model simulates the mechanical behavior of a spring and damper system shown in Output 19.7.1. 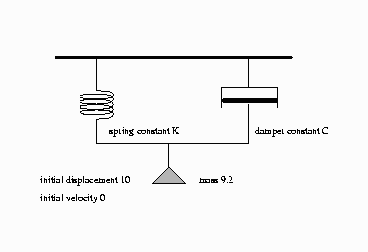 A mass is hung from a spring with spring constant K. The motion is slowed by a damper with damper constant C. The damping force is proportional to the velocity, while the spring force is proportional to the displacement. If the time step is small enough with respect to the changes in the system, the approximation is good. 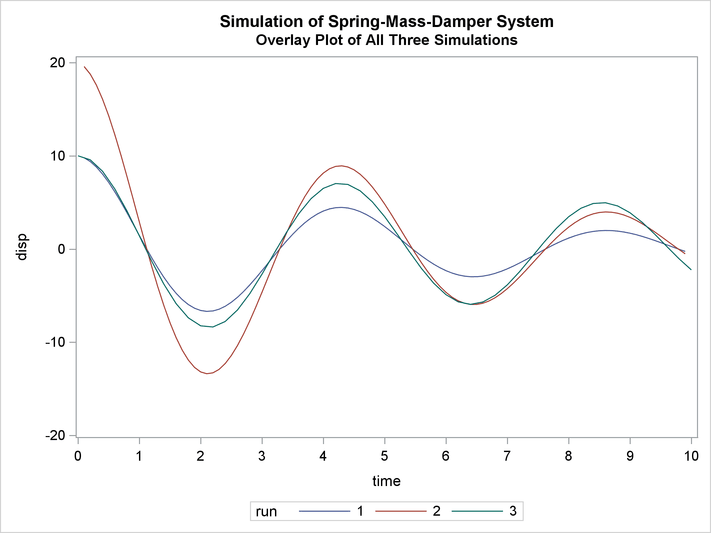 Although PROC MODEL does not have the variable step-size and error-monitoring features of simulators designed for continuous systems, the procedure is a good tool to use for less challenging continuous models. The second form instructs the MODEL procedure to do the integration for you. This model is unusual because there are no exogenous variables, and endogenous data are not needed. Although you still need a SAS data set to count the simulation periods, no actual data are brought in. The displacement scale is zeroed at the point where the force of gravity is offset, so the acceleration of the gravity constant is omitted from the force equation. The control variable C and K represent the damper and the spring constants respectively. The output SAS data sets that contain the solution results are merged and the displacement time paths for the three simulations are plotted. The three runs are identified on the plot as 1, 2, and 3. The following statements produce Output 19.7.2 through Output 19.7.6.